Penn State grad students and supporters rallied outside Old Main in support of unionizing graduate assistants. A group of graduate students at Penn State was hard at work. They weren't getting ready for an exam or preparing a paper for a conference. Instead, they were making signs and strategizing. Their goal is to unionize graduate assistants who work for Penn State. Garret Ducharme is working toward a PhD in physics. He wants to see a union. “I’ve noticed a lot of problems in my department, things like unequal pay, unequal teaching responsibilities, unequal work responsibilities among graduate students,” Ducharme said. Ducharme and other grad assistants will vote in April on whether or not to unionize. The dates for voting have been tentatively set for April 10-13 at University Park; April 16 at Penn State Hershey; and April 17 at Penn State Harrisburg. Katie Warczak is a grad student and spokeswoman for the Coalition of Graduate Employees. She said the coalition wants to make Penn State better. “It’s about keeping the good in what we have and building up the university and the work that we love so much,” she said. Health benefits, pay and greater transparency are some of the issues grad students point to. The university counters that it offers good health coverage, competitive stipends and opportunities for grad students to be heard. In February of this year, a ruling from the Pennsylvania Labor Relations Board found that Penn State grad assistants can vote on unionizing. The decision will follow several years of organizing by grad students and opposition by the university. Some grad assistants are against it too. Pat Macko will graduate in May with a PhD. She’s had an assistantship, working 20 hours a week. “For what I did for 20 hours I was treated extremely fairly over those three and a half years,” Macko said. She has seen in the past how unions might have been needed, but thinks the conditions are good for grad assistants at Penn State. “The students that have come to me that are trying to unionize cannot really explain in detail the benefits the GAs would have if they unionize," she said. Graduate assistants work with faculty, either as teaching assistants or research assistants. The average stipend is about $22,000 this school year, along with health benefits and free tuition. Chad Drexler doesn’t support the union either. He is working on a PhD in chemistry. The university points to that type of in-depth work, saying it could be affected by a union. It argues the union could bargain over the number of hours graduate students spend on research, even if a project requires more time. Regina Vasilatos-Younken is dean of the graduate school. She said the unique relationship between faculty mentors and graduate students is the hallmark of graduate degrees. She said that means students work on unique research, their career goals and things that excite them. “All of that is part of what makes it so distinctive to be in graduate school here and what we are so focused on wanting to preserve because it elevates the degree programs and the quality of what the students get,” she said. She said there are a number of ways for grad assistants to address problems that do come up. “We are here for every individual graduate student, and we are solely dedicated to their interests in finding solutions to these things,” she said. Lafer said unions can take money out of the relationships between faculty and doctoral students, keeping the focus on scholarship and academic merit. Mary Bellman also supports the grad students. She is on the faculty in the School for Labor and Employment Relations at Penn State. She said a union would mean more protections, like being able to report misconduct without fear of retaliation. “There’s nothing that I can imagine in a union contract that would prevent them from continuing to fulfill their role as students, and continue to be mentored, continue to perform their same duties,” Bellman said. Bellman was one of the faculty and staff members at a rally the Coalition of Graduate Employees held recently in front of Old Main, the university’s administration building. They’re hoping to gather enough support for a yes vote on unionization. In fall 2017, there were about 4,300 graduate assistants, fellows and trainees across the University. A date for a vote has not been set, but it is expected this semester. Correction: Mary Bellman's name was originally misspelled. We apologize for the error. "What do we want? Unions! When do we want it? Now." That chant was part of the demonstration Penn State graduate student employees who want to unionize held Wednesday in front of Old Main, the university administration building. Among those clapping and cheering at a pro-union rally were faculty, employees and politicians. Derek Fox, an associate professor of astronomy and astrophysics, said graduate students have voted to unionize at other institutions and the sky hasn’t fallen. 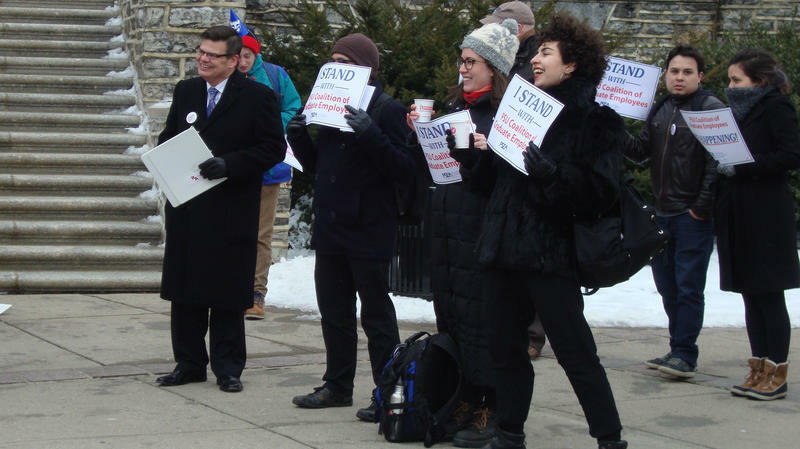 The Coalition for Graduate Employees at Penn State University Park held a rally on the steps of Old Main to kick off a campaign to unionize the university’s 3,500 graduate employees. They have been working towards this point since September when the coalition officially announced its intentions. Nathaniel Porter is a fifth year Ph.D. student and graduate employee in the sociology department at Penn State. He says graduate employees are vital at the university and their wages should reflect that. On Nov. 16, the U.S. House of Representatives passed the Republican tax plan. It would make changes including counting graduate scholarships and tuition discounts as taxable income. That has raised concerns for some, including the administration at Penn State. Sheila West, a professor of biobehavioral health and nutrition at Penn State, is also the parent of a college student. Her son is in his first year at Penn State. He wants to become an architect. 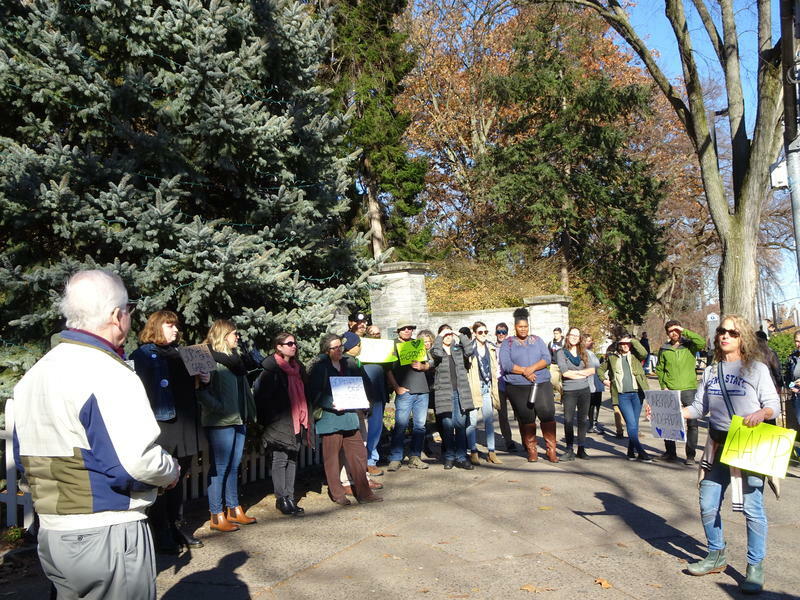 Penn State faculty, grad students and supporters rallied at the Allen Street gates in State College Wednesday. They were protesting a tax hike for graduate students included in the GOP House tax plan. One member of the group, Margarita Hernandez, is in her first year working toward a PhD in anthropology. “We already get paid enough to live or so. 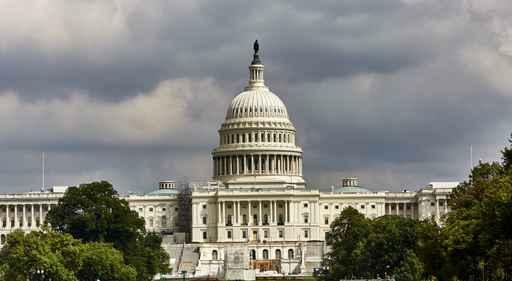 But, that extra tax is going to make that so it’s not feasible anymore,” Hernandez said. Adriana Rizzo, a first year PhD student in geosciences, said the change would be an economic hardship for a lot of students.